Countdown to Geekmas Day 15: Freakin&#39; Augmented Reality Ski Goggles!!! Countdown to Geekmas Day 15: Freakin' Augmented Reality Ski Goggles!!! First of all, let's be clear: none of you are allowed to show this to hubby or else it's what he'll be wanting under the tree this year. And who could blame him? These are the absolute best freaking piece of high tech sports equipment I have ever seen. Ever. So you're thinking: um, ski goggles? Why is she freaking out over ski goggles? 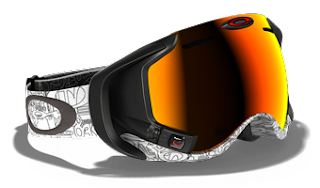 Specifically, Oakley Airwave HUD Goggles? Music. They play your MP3s. GPS. They know where you are. Buddy tracking. They know where your friends are. Navigation. They can help you figure out where you are going. Speed and Jump Metrics. They know how fast you are going and can tell you what the hell that move was that you just did. Replay. and then they can tell you again and again so you can prove it to your ski buddies. A wrist remote. So you can change things up on the go. Oh yeah, and a heads-up display. So you can view all this information right on your lenses. As if it was on a 14" screen. I'm not sure you heard me: A DIGITAL DISPLAY ON YOUR GOGGLES. I thought this stuff only existed in the movies, or in beta with Google Goggles. But no. You can buy this technology to go skiing. Skiing! So here's my question: Since I still haven't received my Google Goggles (they're probably still in the mail), would it be weird if I wanted to wear these goggles in everyday life? Probably. But do I care? Well, maybe. At $600, you're paying for this level of kewl. But it really is a whole new level of kewl. See them for yourself. And just try to keep your mouth from hanging open. Just try.